A comedian who spent years warming up Conan O’Brien’s late-night audience, Jimmy Pardo has become a podcast darling with Never Not Funny. One of the longest running podcasts, Never Not Funny pits Pardo against an ever-changing cast of real-life characters, including co-host Matt Belknap and unofficial third chair Pat Francis. On March 4th, Pardo and Belknap will embark on NNF’s annual Pardcast-A-Thon, raising money for Smile Train. Last year, Pardo and company raised over $181,000. Pardo was in Chicago recently to take his son to Hamilton and stopped by the A.V. Club offices to appear on our Facebook Live show, A.V. Club Live. There, he took on Associate Editor Gwen Ihnat in Chicago trivia and answered our 11 Questions. If you’d like to see him do that live, the clip is below, but otherwise, here are his answers all written out, just like most of our readers are probably used to. Jimmy Pardo: I’d like more people to ask me more about my high school band Rainbow Bridge. Nobody digs deep enough into that. They always say, “Hey, you were in a band in high school. What was the name of that band?” And then once I say “Rainbow Bridge,” they seem to get caught up on the name of the band, then we never really get into the details of the band. So eventually I’d like somebody to have a follow-up about Rainbow Bridge. The A.V. Club: What did you play? JP: Nah, this isn’t the time. AVC: No, now I really want to know. JP: I was the lead singer. We had K. Paul Boyev up on guitar. We had Mike Rago on bass, Brian Mell on drums, and Jim Rago on keyboard. They were all terrifically and wonderfully talented. I had what can only be described as the worst voice in the history of music, but because I kind of started the band, they wouldn’t kick me out. I assumed that was why. But I was the lead singer. JP: We did mostly covers, mostly Chicago and Jimi Hendrix. We did “Evil Ways” by Santana as well. And then we did a couple of originals that was those guys kind of jamming and David Lee Roth talk-singing over it, and maybe the lyrics changed from show to show. But then we eventually became a heavy-metal band, and when you hear my voice, it’s pretty deep—it’s not good. We were doing Judas Priest and Sabbath and stuff like that. We were horrible. No, they were great—I was horrible. AVC: Where did you play? JP: We did mainly school parties, and then we were in the battle of the bands at Roller Wheels in Crestwood, Illinois, and I think we made it through to the semifinals. We made it that far and then got trounced by a band called Quick Change. AVC: I get why people get hung up on the name Rainbow Bridge. It has since taken on rather sad connotations. AVC: A lot of high school boys seem to be into Hendrix. JP: I was not. I wasn’t into Hendrix until I got older. AVC: Sometimes people can be a little too into Hendrix. JP: I feel that same way about Van Morrison, and everybody yells at me about that one. I feel like I got my fill of Van Morrison in high school. I don’t need to hear him anymore. But I’m told I’m wrong. So I’ll revisit it. JP: Oh, a giant kitty cat, no question. I understand that’s a tiger or a lion. I understand there already are giant kitty cats, but I want a giant kitty cat. I’m definitely allergic, by the way, but I love kitty cats. But you know how gentle and sweet they are, the kitty cat? Blow that up. And that’s what I would ride around. AVC: You don’t think it would amble around and just take a nap? JP: No, it would be so excited to have a podcaster on its back that it would proudly walk down the streets. A kitty cat, not a tiger or a lion. I’m afraid of those. JP: I would like it to be a black cat in honor of Janet Jackson’s new baby. That’s a song, “Black Cat,” right? AVC: How many times have you seen it? JP: Twice. No, hundreds. It was the first video my father had. We had it on, might have been, a Beta tape. So the only movie he had at his house was Airplane!. And my parents were divorced. So every weekend we would go to my dad’s, and we’d say every weekend, “Hey, Dad, can we watch Airplane! ?” We watched Airplane! constantly. And then Breaking Away is probably a second, and Caddyshack. Those are probably the three. AVC: That sort of scenario has come up a few times with this question. Everyone seemed to watch the hell out of the first tape they owned. JP: We were mesmerized by the idea of videotapes back in the ’80s. AVC: Luckily, Airplane! is a good movie. JP: I tried to watch it with my son, but he’s too young. Some of the subtleties aren’t there for him yet. He can’t grasp it yet. AVC: How old is he? AVC: Yeah, he needs to be, like, 11. JP: I think so. Just a couple years, and then I think he’s going to love it. JP: There’s so many of these, I can’t even. One of the things that just came up recently—and this just came up on my podcast. Lisa Loeb was just on my podcast. We were talking about using teleprompters and the ones that celebrities and politicians use with the cool-looking glass. She mentioned that she thought that they were bulletproof glass so they could avoid getting shot. And then I went, “Oh my God, that’s what I’ve always thought.” Up until like a year ago, then I figured it out. And then Matt Belknap, my co-host, was like, “I’ve always thought that too.” So here are three human adults on the same stage announcing that at some point we thought that those were to protect the person talking. JP: Very small, and if you’re ahead of it, you’re getting shot in the face. But very specifically from those two angles, you’re safe. But I thought they were bulletproof because, to me, the idea that those were teleprompters, that’s Star Trek to me. That was, like, the future. AVC: They could be bulletproof. We don’t know. JP: You’re right about that. JP: That I’m Don Pardo’s grandson. I don’t know if it’s interesting, but it’s the one that most people say. In fact, somebody keeps putting on my Wikipedia page that I’m either Don Pardo’s son or grandson. I had an audition recently where the woman said, “I understand that you’re Don Pardo’s grandson,” and I said, “No, I am not.” And you should have seen the look of disappointment on her face. It may have cost me the job. It was that devastating to her that I wasn’t related to Don Pardo. AVC: Well, you have an announcer voice, and you’ve done all sorts of voice-related stuff, so you can see why they want that to be true. JP: It’s not a common name, and we’re both in show business. Well, he was. I do my nonsense. So yeah, I can understand it. But don’t get mad at me. AVC: It’s not your fault that false information is out there. JP: It’s kind of a roundabout thing. My wife, Danielle Koenig, her father is Walter Koenig, from the original Star Trek movies and series. And when I first introduced her to my family, my cousin’s husband said, “So you’re Sulu’s daughter?” And my wife was like, “No, I’m Walter Koenig’s daughter.” And he was like, “No, I read that you’re Sulu’s daughter.” And he insisted that it was Sulu’s daughter. He’s Asian. He just couldn’t figure it out. I guess she was adopted? AVC: If anyone would know, it would be her. JP: I just had a tarantula. It wasn’t that bad. It was fried, so it was like eating nothing. I did something for Wil Wheaton’s show on Syfy where I went to Comic-Con and was at the Boxtrolls exhibit. Because all the Boxtrolls ate bugs in the movie, they were giving out bugs to eat, and I ate it on camera. It was a tarantula and something else. I didn’t eat the cricket because it was just, like, they had little eyes looking at me. I couldn’t do it. AVC: Tarantulas have eyes. And they’re hairy. JP: But again, it was fried, so you couldn’t taste it. The cricket was half-fried, like they gave it a little pseudo-fry. It still had its head, but it was like a tuxedo of fried goods. JP: KISS with Judas Priest opening at the amphitheater here in Chicago. It was me, my brother, my cousin Ron, and my mother took us, which at the time I thought was outrageous. And it turns out that my mom at the time was 32, so it’s not that outrageous for a 32-year-old to go to a concert. But it was the KISS Dynasty tour in 1979. JP: I’ve since heard bootlegs of the show since then, and it was horrible, as it turns out. But as a kid, seeing your heroes—these superheroes, larger than life—it was amazing. 8. What’s the most interesting opportunity you’ve ever gotten through your work? JP: When I got the phone call coming back from the gymnasium that Andy Richter had to miss a couple of days on Conan. Conan called, and—his words, not mine—Conan said, “Will you co-host with me?” So when I got the phone call to co-host Conan with Conan for a couple shows, that was it. That was like to go from being the warm-up to doing remotes to being a regular guest to doing sketches and then being asked to co-host. It was quite an honor because they could have chosen anybody in show business, and Conan chose me. It was great. Howie Mandel was on the first part, and then I ended up having a nice relationship with Howie. I had never met Howie, and he turned to me during the first commercial break and goes, “You’re amazingly funny.” “Oh wow, thank you.” And then his assistant contacted me to have a meeting with Howie, and then we had a little project going for a little while. So it was really this one phone call. I guess in the big scheme of things, when I got the initial phone call to work for Conan, that also kind of changed things. JP: Which one do we want to do? Do we want to do parachute pants and mesh shirt in high school? Do we want to do that one? Do we want to do Jordache jeans in high school? 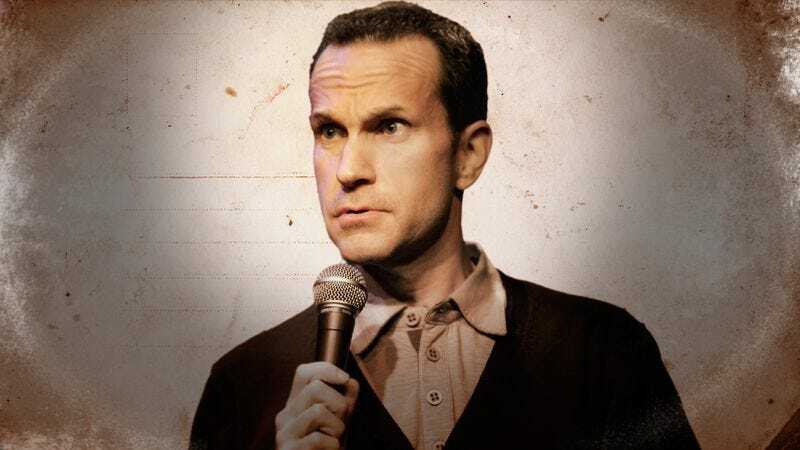 Do we want to do Jimmy Pardo with the new-wave haircut on the South Side of Chicago? Do we want to do that phase? AVC: One of the clips that I preloaded [for a Facebook Live break] was a bit from Conan where you talked about your old headshot. JP: Let me just explain that quickly. That was a photographer in this town named David Renar whose name will forever be in my head because of this photo. We took a bunch of photos, as you do for a headshot. And I took all the photos, and then as I was leaving, I got back into my everyday clothes, which were a disaster. As you could see, I got into my acid-wash jeans and my—I assume those are Reebok. My SNL T-shirt, my Sally Jessy glasses, and I snapped my mullet back on my head. I was just leaving, and he said, “Hey, I got this new film. Will you let me take three pictures of you with this new film? I want to see how it works.” So I said, “Okay, great.” So I sat like that, and he took the pictures, and it was the only picture I liked out of all the pictures. That’s how bad the other ones were. That was the winner. I should have Photoshopped out the SNL T-shirt. Maybe that’s why everyone thought I was related to Don Pardo. I should have Photoshopped that out because that was stupid. Because then everybody at the comedy club thought I worked for Saturday Night Live. Also, a horrible picture. So yeah. We could list my embarrassing phases for hours. JP: Yes, I have. It was either at the A&P or National, I forget which one, in Hometown, Illinois, at the corner of Southwest Highway and 87th Street. The one and only time, I stole a Chunky candy bar. One of those big, square Chunkys, and the only reason I stole that was because it could fit in my pocket. And this is 100 percent true. So I steal it, and I go outside to eat it right in front of the store because what thief doesn’t do that? And then as I’m sitting down, my mom somehow got off work early, and she pulls into the parking lot and is like, “What are you doing here?” I’m just like, “Oh, just went in there,” and I went in and returned it. So I stole it but then put it back before someone caught me for stealing. AVC: And she caught you before you even opened it? JP: Yeah, and it was still in my pocket, like I couldn’t wait to enjoy it. By the way, I don’t even like Chunky candy bars. JP: Raisins, maybe a nut of some sort, and horrible-tasting chocolate. But yeah, I stole it and returned it because I’m a good person. JP: Hillary Clinton. I met Hillary this year. She came close, so that’s a win. It is a win because she’s got more votes. I met Hillary and then Tom Hanks. Conan, Jon Hamm… I work in this business, so I meet a lot of people. Before Hillary, I guess Tom Hanks. Isn’t he the most famous actor? AVC: That’s a judgment call, whether Tom Hanks or Hillary Clinton is more famous. JP: I know who is more well-liked. JP: They go, “Sully, Sully.” So maybe Tom Hanks. Every rumor you hear about Tom Hanks is true. He’s the nicest man in the world. So I guess it would be him. I met George Clooney, but it wasn’t what it was with Tom. It was very brief. And Bono walked past me. Let’s go with Tom Hanks. Bonus 12th question from Rich Fulcher: What are you afraid of now that you never used to be afraid of? JP: There are lots of things. Jumping on the bed. Remember when you were a kid, you’d jump on the bed, and you’d have no worries in the world, and you’d just jump on it? The idea of that now scares the hell out of me. I don’t even know what would happen. Also, falling off a ladder. I grew up in the South Side, and when we would have snow and blizzards and drifts, we would jump off the garage roof into the snow. Now if I’m up on a step ladder and I think I’m going to fall, it’s a foot and a half off the ground, but I’m panicked about it. So I’m afraid of ladders and those beds. AVC: I’ve definitely gotten more fearful of ladders as I’ve gotten older. Sometimes you see people on really tall ladders, and it’s terrifying. Are they strapped in? JP: It scares the hell out of me. I had to clean out the gutters—I put up new gutters three years ago at my house, and it’s rained one time since I put those up, so thank heavens I panicked and put those on. But I had to go up and clean the leaves and, again, that’s only 8 feet up in the air, but you would have thought I was Spider-Man scaling the Willis Tower. AVC: They have a Roomba that can do that for you. There’s a gutter-cleaning Roomba. JP: The fact that I now know that… Because I have a Roomba that has not left its docking place. After three months, it seems like a hassle to even press “go” on it. JP: Have you ever been punched in the face and why? AVC: How did it go? JP: Not well. We had a guy named Mike Doody. We were skitching. Is that what you call it these days when you ride on the back of a bumper on the ice and you let a car drag you around? I was deathly afraid of doing that, and one day I said “Let’s do it,” and the one car that we had the courage to do it on, the guy yells out the window, “You want to get off of there. You want to stop that.” And he stopped the car, and his two kids got out and started kicking the crap out of us. They chased us and threw us down on the snow and started wailing on us. That was the only time I ever got punched in the face.